Chang’s fifth novel is a turbo-charged requiem for a blood brotherhood rooted in an impossibly distant past. Some people are lucky at cards, some lucky in love. Even though he’s waiting for his ladylove, attorney Alexandra Lee-Chow, to make her way through a messy divorce, Detective Jack Yu of the NYPD’s Fifth District is still lucky because none of the many criminals who’ve shot at him have killed him. But he can’t hold a candle to Tat “Lucky” Louie, the blood brother of his youth, who’s just emerged from an 88-day coma brought on by his own shooting. Everyone in Chinatown recognizes that the number 88 is especially lucky, and Jack would like nothing better than to shake Lucky’s hand, congratulate him on his return to life, and endorse his vow to avoid the kind of criminal behavior that brought him to death’s door. Instead, Lucky disappears shortly after Jack helps spirit him out of the hospital. 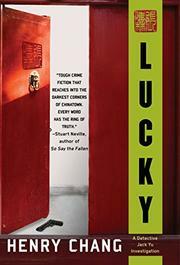 Fueled less by greed than by a lust for face-saving revenge, Lucky gathers a new gang around him and plots a series of high-octane crimes against his old enemies, from Big Uncle Jo, a gang handler from the On Yee Merchants Association, to Woo Sik Kee, a longtime stalwart of the Wo Lok triad. Though Lucky’s improbable survival makes him feel immortal, Jack knows his latest carnival of crime can’t end well; if rival Chinatown gangsters don’t stop him, Jack’s outraged colleagues at the Fifth District will. Despite some great action sequences, the story, as usual with Chang (Death Money, 2014, etc. ), lacks both variety and surprise. What keeps you reading, along with the customary warts-and-all portrait of New York’s Chinatown, is the uncanny strength of the bond between the career cop and his doomed blood brother.